Sometimes we forget that it’s the little things that add up to success. Remember when you were small and your parents made you brush your teeth everyday and make your bed- those little disciplines are an important part of life and when it comes to steelhead fishing it’s no different- paying attention to the little details will result in more success. Remember, it’s 10% of anglers that catch 90% of the fish! Here are some of the details that the 10%’ers pay attention to. Sharp hooks: this almost goes with out saying but it does so easily mess you up. 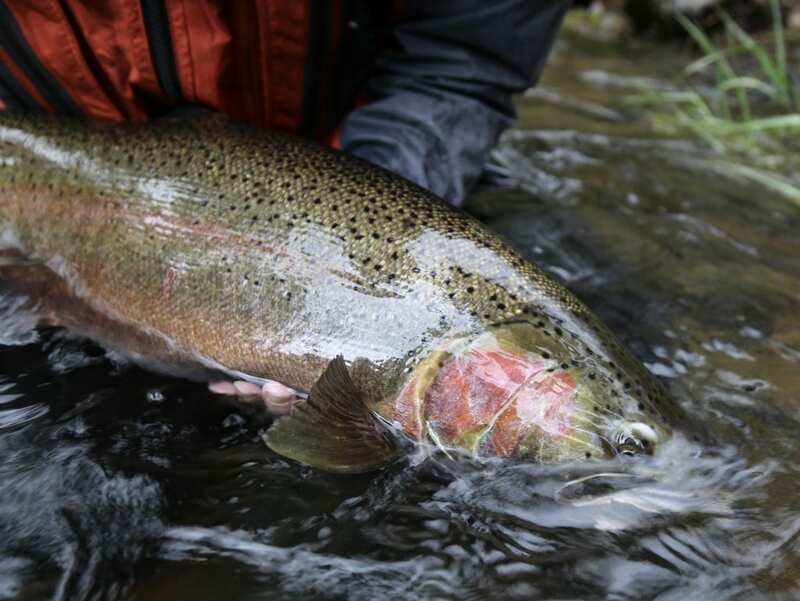 Let’s face it-it’s winter steelhead season and you’ve got to get that fly deep; that means your occasionally snagging the bottom. Forget to get that hook sharp and the next cast could be your missed opportunity at a fish of a lifetime. Here’s the old saying worth remembering: Dull hooks make for good stories (ie, the one that got away) and sharp hooks make for good photos! Keep a hook file handy and always check for sharpness after snagging bottom or landing a fish. Test for sharpness by pressing the hookpoint into your thumbnail. If it slides it’s dull if it sticks it’s sharp enough! Keep Moving: Again, it’s the simple things right? Cast, swing, step repeat seems pretty simple but it’s amazing how many anglers I see that can’t keep that simple procedure. When it comes to the swung fly – moving through the run with a consistent cadence is part of the strategy that triggers fish to respond to your fly! Consistently stepping down stream for the next cast 3-5′ every time is essential. (Move more distance between casts in clear/green water and less in murky water). If wading is causing you trouble try better traction- I like the Korkers boots with interchangeable soles. Their big spikes are like 4 wheel drive and are the best I’ve used. A wading staff can be a big help here too! Manage Your Swing: This one is a bit tougher to get; its partly because its something that with experience you get a feel for. I find that anglers that actively manage their swing as needed catch more fish opposed to guys who simply cast out and hang on letting the river do what it will. To get this to work best for you imagine your fly and how it moves. Your goal should be an even swing speed and an easy consistently moving target for steelhead to latch onto. Often times that means slowing down your fly at first (where water tends to be faster) and then speeding it up again towards the end of the swing where water is slower. This careful management of your swing will help you find more consistent results on winter steelhead. Don’t Yank! We work so hard for so many hours of casting and swinging the fly it’s heartbreaking to see the moment of truth happen and anglers react by yanking the fly out of the fish’s mouth at the first little tug. This precise little moment is the real deal, where the rubber meets the road and is everything between success and failure; your response is key! Winter time grabs in cold water are often a multi-part thing. Often starting with a small tap that feels like a small trout, then a tug followed by a heavier tug, then the weight of the fish. Sometimes more tugs; sometimes less or none at all but the fact remains it’s not always just full on. This requires patience and nerves of steel! The best thing to do is simply – nothing! Have your drag set lightly but just heavy enough it doesn’t backlash when you rip some line off the reel. Allow the fish to hook itself. When you feel the heaviness of the fish solidly on the line bend the rod towards the downstream bank and your on!